U.S. Marines Semper Fidelis Cycling Shorts. 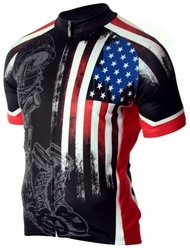 Pick up Primal Wear's newest addition to their military line up of cycling wear. They have completely redesigned the Marine shorts for today's soldier or military family member. Contructed with 5 Anatomically Contoured Panels, Flatlock Stitching, Influx Leg Grippers, 100% Premium Lycra, 9.5" Inseam and 4T-MS Italian Chamois. Free shipping in the U.S.!